Shows mythical River of the West. Nouveau Mexique, Louisiane, Canada, et Nlle. Angleterre. Brion de la Tour, L., Atlas General, Civil et Ecclesiastique, (Desnos, Paris) 1766. Very good condition. Some edge toning. Blank on verso. Original centerfold. Wheat, C. I., Mapping of the Transmississippi West, 1540 – 1861, #219. 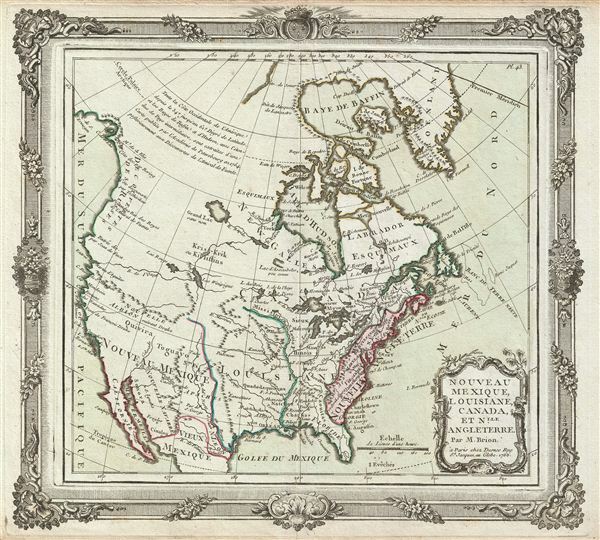 Sellers, John R. and Van Ee, Patricia, Maps and Charts of North America, # 117. Lowery, W., The Lowery Collection, #502.